The Scorpions look strong this year and rumour has it that Rob Godfrey was looking to turn us over. 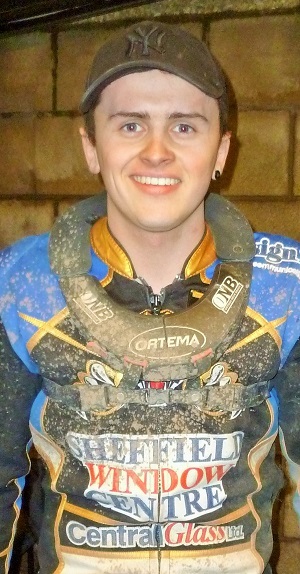 Richard Lawson guested for early injury victim Steve Worrall and if anything his inclusion made them stronger. The Tigers riders had done well earlier in the week, Kyle got an 11+4 paid max for Wolverhampton, Charles 9+1 for Somerset, Lasse 7+1 guesting for Belle Vue, and Jack scored 13 for 3rd place in the U21 British semi-final at Birmingham. James though was still finding points hard to come by for Poole. After the first warm summers day with clear blue skies I'm guessing the track conditions caught the home riders out. Heat 1 and Kyle off gate 3 was the meat in a Scorpion sandwich and spent four laps fruitlessly chasing Richard Lawson without ever getting into contention. Garry Phillips trapped ahead in heat 2 and it looked like being a shared heat until Gino Manzares gambled on an outside blast which took him past James on the back straight on the last lap. Josh Auty left everyone standing at the start of heat 3, but Peter Clarke invited him to remain stationary at the second attempt. The Tigers emerged from the second bend in the lead with Josh climbing all over Todd. Josh then went for the outside blast at the start of lap 3 only to perform a 270º pirouette and then fall. Jason Garrity showed he hasn't forgotten his way around Owlerton with a tapes to flag win in heat 4. Gino passed Lasse entering the third bend on the first lap and then James at the start of lap two. Lasse looked strangely subdued until we realized he had a flat tyre. Stefan trapped ahead in heat 5 with Charles looking for an outside pass only for Richard to dive through on the inside at the end of the first lap. Two consecutive maximum heat wins and the Scorpions are in the driving seat and six points ahead! Lasse rides a neat line to deny Richard any passing chances, and Jack does an equally good job ahead of Stefan in heat 11. Charles peforms wonders to stay ahead of Josh in heat 12 while James has a slightly easier time beating Gino and the Tigers extend their lead to four points. Richard gates to lead heat 13 from Kyle. Lasse dives past Jason on the inside of turn 3 while Kyle builds up momentum before diving inside Richard at the start of the second lap. With the Tigers six ahead Dave Peet uses his tactical substitute replacing Gino with guest Richard Lawson. Jack and Jake have a coming together on the first turn and Peter says "all four back". Jack makes a cracking start off gate 1 and Charles sits on his tail for two laps. With the Scorpions challenging on every bend Charles decides the win will be sufficient and pulls ahead leaving Jack to his own devices. To the home fans delight he keeps his cool and beats Richard to the line! Kyle and Charles are Simons nominations and they are against Jake and Jason. Kyle traps and is gone while Jake and Charles have an epic four lap tussle with the lead changing hands to many times to recall. Charles gets the verdict and the Tigers win by 14 points. A match to remember!